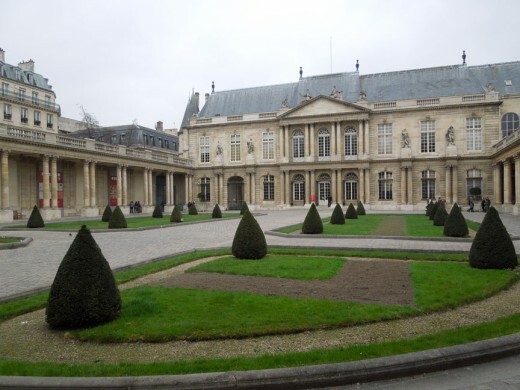 Pierre Alexis Delamair and Germain Boffrand, Hôtel de Rohan-Soubise, 1704-1707, Paris. With three full-time, two part-time, and several affiliated faculty, we are currently the only program in the Northern Rocky Mountains able to offer students an innovative curriculum that fosters a critical understanding of the production of art and its environment from the ancient world to the present. While maintaining a commitment to rigorous historical research, we work beyond the traditional boundaries of Art History to explore new perspectives arising from intercultural exchanges, interdisciplinary approaches, and theoretical inquiries. Faculty have extensive experience in field, museum, and archival research, a strong record of scholarly publications, and strong backgrounds in theory and methods. We prepare graduate students for careers in academic instruction, art administration, and art criticism. The program is supported by the Art History Graduate Offices, the Visual Resources Collection, the Helen E. Copeland Gallery, the Roland R. Renne Library, and the Museum of the Rockies. Students participate regularly in departmental symposia with the expectation that they will become informed and effective writers and speakers. We welcome inquiries and applications from students who have an academic background in art history or a broad spectrum of the humanities and social sciences. Candidates should have the motivation to learn to read a foreign language, to employ analytical structures, and to make timely progress through the two-year program. At the time of application, all graduate MA candidates are expected to have completed at least 30 units of undergraduate instruction in art history or a related field in the humanities, together with two years of foreign language. The M.A. Program welcomes applications from all those interested in seeking an advanced degree in Art History. No more than eight students are accepted each year to a thirty-two unit program that emphasizes focused study of cultural production from ancient times to the present and interdisciplinary connections with collateral departments in the Colleges of Arts & Architecture and Letters and Sciences. Art History faculty meet twice a year to read and assess applications, with a particular sensitivity to the students’ work and professional goals. All materials must be uploaded by March 15 or October 15 for full consideration. The application consists of a standardized form and processing fee required by the university as well as individual writings and documents required by the department. A non-refundable application fee of $60 is required for all applicants. International applicants must also include an official English proficiency exam score report and a completed and signed Financial Certificate; please see http://www.montana.edu/international/admissions/docs/graduatefinancialcertificate.pdf for complete details. Candidates are responsible for ensuring that all requisite application materials are submitted by March 15 or October 15. Guidelines: The faculty consider the letter of intent and the writing sample to be among the most important parts of the application. The letter should describe your preparation for the program, academic interests, and professional goals. The most useful statements are those that present an intellectual portrait of the applicant, an account of the issues the applicant now finds engaging, and the program of study the candidate envisions for him/herself at MSU. The writing sample should be a substantial essay, ideally a seminar paper or senior thesis, that demonstrates the candidate’s potential for advanced work in the discipline. Letters of recommendation are most helpful when they speak of the applicant’s academic and professional achievements in Art History or related fields such as History, Literature, Foreign Language, and potential for graduate study. Letters from professors or curators are generally far more effective than those from counselors, employers, or friends. Many graduate students receive teaching assistantships and fee waivers to help defray the cost of graduate study. However, financial aid is available to graduate students who show evidence of financial need. While such assistance may take various forms, most graduate students receive aid through loans or the work/study program. For further information, consult the Graduate School on-line at http://www.montana.edu/gradschool/ and contact the Financial Aid Office (located on the lower floor of the Strand Union Building, MSU) at (406)994-2845. Assistantships are awarded annually on a competitive basis; all interested students, including current TAs, must apply for the new academic year. Teaching assistantships are awarded in the spring for the following academic year. Teaching assistantships carry with them tuition waivers. Tuition waivers cover tuition only. Fees such as registration, building, computer equipment, insurance, etc. are not covered by the waiver. In addition to teaching assistantships, advanced graduate students may be offered the opportunity to design and teach a summer course. These scholarships will be awarded through the School of Arts admission committee. Separate applications for scholarship are unnecessary as the scholarships will be awarded based on merit of applications and reviewed at the time of offer. 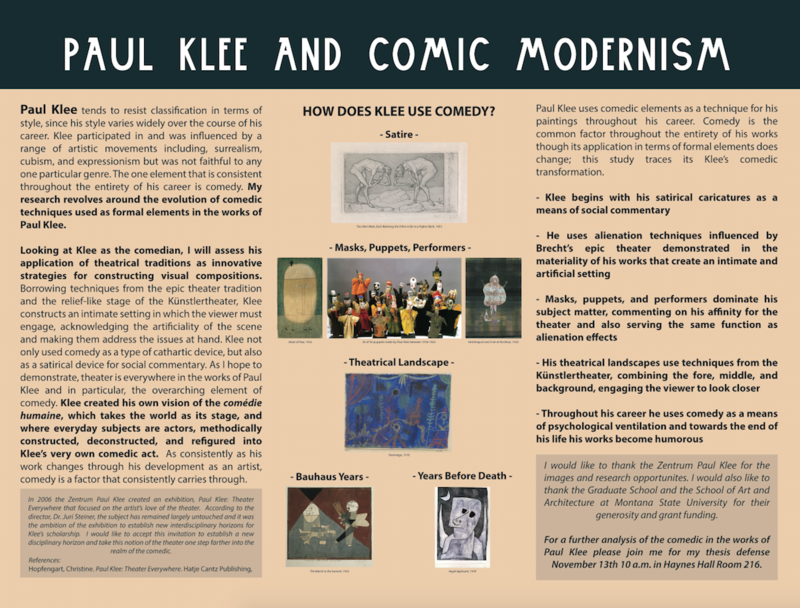 Recent MA Graduate Student Jesine Munson placed first in the category of Architecture, Arts, & Humanities for the 2015 Graduate Student Summit Research Rendezvous Poster Session with her poster entitled "Paul Klee and Comic Modernism." She will receive a $250 travel grant towards participation in a domestic professional conference and plans on attending our annual CAA conference in Washington D.C. and has also applied to speak at Boston University Graduate Symposium on the History of Art and Architecture. Jesine is currently an adjunct teacher for the School of Art and a doctoral candidate in the American Studies program at MSU.